Pictures of the temple taken in the summer of 2006 (left) and 2008 (right), showing the building addition that had been completed in the interval. Perform various religious activities such as traditional Puja, Bhajan, Satsang, Havan, and Arati. Preserve the Hindu identity (religion, culture, and traditions) for future generations. Promote Indian culture and values. Provide humanitarian services to the local and world community. Promote study and understanding of all religions of the world. 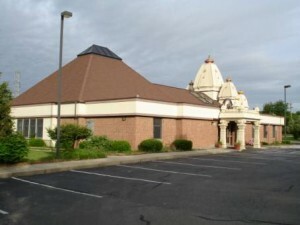 The Bharatiya Temple of Lansing is located at 955 Haslett Road, Haslett, Michigan 48840 .
the first group of Trustees of the Temple. 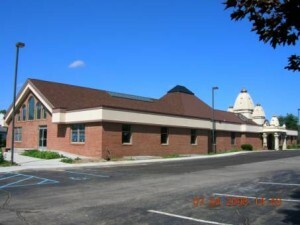 The Temple has brought our community together, providing the mid-Michigan Hindu and Jain community a place to practice our religion, foster spiritual growth, and introduce the Hindu religion and culture to our children and to those interested in learning about them. It was a particularly proud moment for our community when East Lansing High School’s graduating seniors held their Baccalaureate event at our Temple in May 2009. It has fostered numerous religious, spiritual, and social programs. Moreover, the Temple has been critical to increasing the visibility of our community in the Greater Lansing area. Since January 1998, the Temple has had the services of full-time priests. For most of the time, there have been two priests. Upon the arrival of the priests, the Temple open hours were expanded and a schedule of two Pujas every day of the year was implemented .Both priests are available for private pujas at devotees homes or places of business. To schedule services both in and outside the temple, please call them either at the temple (phone number 517-339-6337) or at their homes. For Shastriji: home phone number is 517-575-0888, cell number is 517-944-2100, and e-mail is shastrimaharaj@gmail.com. For Panditji: cell number is 602-363-4462 and e-mail is vedicpandit@gmail.com. Another way to schedule their services is to contact the Temple’s Religious Events committee chairperson, Meena Sharma at (517) 927-3294 or by e-mailing to sharmamt@aol.com. If you are residing in or visiting the Lansing area, we invite you to visit our Temple, no matter whether your interest is to observe or to participate. For further information about the Temple, please call any member of the democratically-elected nine-member Board of Trustees. We have created Links to several Web sites devoted to Hinduism, Hindu organizations, other Bharatiya religions, general-interest topics dealing with India, and Indian stories for children.